Who is this smiling critter? Usual challenge rules apply, including moderated comments (to give everyone a chance to take part) and possible bonus points for beating others with the first correct answers, additional relevant information, or any suitably humorous quips. I’ll give 2 points each for order, family, genus and species. This is the last challenge of the current BitB Challenge Session, so the current leaders are playing for all the marbles! This entry was posted in [No taxon] and tagged Arkansas, entomology, insects, nature, quiz, science, Super Crop Challenge. Bookmark the permalink. A nice one–I’ve not seen this species, though it is supposed to be in my area. Nice – 2 pts each for order, family, genus and species. Unfortunately, I do have to deduct 1 pt for not italicizing the scientific binomen (I’m a stickler for that). However, since you’re the first of four participants to answer correctly you do score an additional 3 bonus pts. I’m gonna take a WILD guess and say this is some sort of grasshopper–that’s Orthoptera, isn’t it? Being from Louisiana, I was originally gonna say it was a bug/crawfish intermediate, and was hoping you might name it for me. Yes, Orthoptera (and 2 pts), but not a grasshopper. I can see the crawfish heritage, so I’ll give you a bonus point for that. I think it’s a hemipteran bug of some kind but no idea further than that! (if not it’s a beetle but I don’t think so). Sorry Laurie, not a hemipteran. To be fair, however, I purposely cropped the photo so the cone would look like the “nose” of a leafhopper or planthopper. Total = 1 pity point! I’d go with Pyrgocorypha uncinata (Harris) [Orthoptera: Tettigoniidae: Conocephalinae: Copiphorini], or hook-faced conehead katydid. Hi Sam, and your ID is perfect. 2 pts each for order, family, genus and species gives you 8 pts, plus 2 bonus pts for being the 2nd of 4 with the correct ID. Total = 10 pts and tied for the lead. Genus and Species: @Pyrgocorypha uncinata@ (Harris, 1841). Total = 11 pts and the new leader. I think that’s actually an extension off of the top of the head, with the mouth down and to the left outside of the picture. At first I thought maybe it was a thorn-mimic Membracid, with that hook being a pronotum extension, but Membracidae don’t seem to have prominent antennae like that. Instead, I’ll guess that it’s an Orthoptera, because some of the katydids (family Tettigoniidae) have that kind of foreward-projecting frons and vertex with the antennae . Particularly the Coneheads (tribe Copiphorini). I’m not seeing any that look exactly like this (which isn’t surprising if this is another of your South American pictures), but a number of them are close. Particularly the genus Belocephalus. And Belocephalus subapterus has almost exactly the same shape (although the color is off). This also goes along with the pronounced “pupil effect” on the compound eyes making it look like it is looking at us, since katydids are one of the insect groups that show that effect. Hi Tim – so close, but so far away. You got the order and family (and even the subfamily/tribe), but not the genus/species (so 4 pts). Belocephalus subapterus has a similarly shaped cone but is strictly southeastern coastal plain (I purposely left “Arkansas” in the tags as a clue). “Jimmy Durante” is worth a humor point. Well, this one is a little out of my league. My first instinct was that this was some sort of conehead katydid, based on the “horn” and the way the face slants inwards. But I couldn’t find any katydids (or other orthopterans) that even came close. When I took another look at your photo, the eye and the “pits” on top of the head seemed like what I’d expect to see on a stink bug. But I couldn’t find any matches there either. None of the true bugs I saw had eyes that close to their antennae, not to mention the odd hook on the nose. 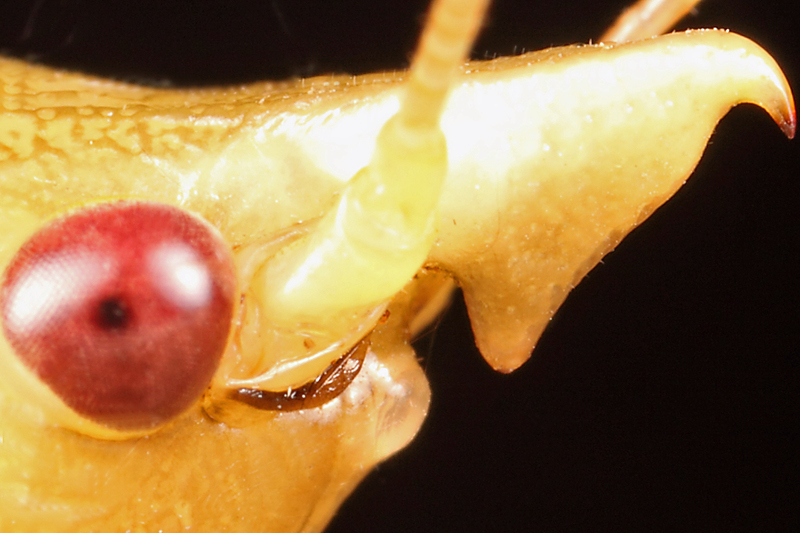 So, I took another look at the photo and kept coming back to the conehead katydids. The eye-antennae distance seemed much closer, and although I couldn’t find an exact match on the hook, at least the coneheads have similar projections. I’m still not 100% sure, but I’m going to say Order–Orthoptera, Family–Tettigoniidae, and just so I can use italics this time, I’m going to guess that the Genus is Neoconocephalus , the common coneheads. Hi Mr. P – your first instinct was correct, as this is indeed a conehead katydid—it’s good your reasoning ultimately led you back to that decision. Neoconocephalus is a good guess, but the distinctive hook at the tip of the cone is not found in any species of that genus (at least that I am aware of). Hi FlaPack – thanks for finally mustering the courage to play. Good thing you did, as your ID is correct and worth the maximum 8 pts. Not enough to take the win, as some others got the correct ID more quickly, but a strong showing for your first participation. Hah! bubguide. Always do that — bugguide.